Our fifth-floor long-term exhibit shows consumer goods that were once made here. From beer to barbed wire, cast iron to cut glass, railroad cars to radios – an amazing variety of products were once made right here in Johnstown. A selection of these wares, along with information on the companies that made them and historic photos, are highlighted in the “Made in Johnstown” long-term exhibit on the fifth floor of the Heritage Discovery Center. In 1905 William Allen, a master glasscutter, came to Johnstown to visit relatives and decided to stay and open a small glass cutting operation here. He began with only ten employees. Soon, Allen Cut Glass was sold both locally and across the country. 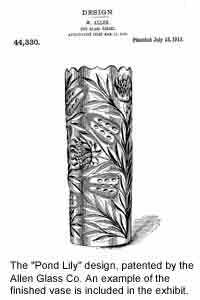 The company patented one unique pattern in 1913, called the “Pond Lily,”as pictured here. Unfortunately, the era of cut glass came to an end partly because of the economic impact of World War I, and partly because of changing tastes. The Allen Glass shop closed in 1920,. Examples of Allen’s cut, etched and engraved glass are part of the exhibit. W. DeFrehn & Sons manufactured chairs, swings and rockers for over a century. Founded in 1854 in Schuykill County, the company moved its operation to Johnstown in 1898. In the early 1900s, the factory produced nearly 40 different styles of wooden chairs, many with pressed back decoration. At that time, the factory had 50 employees and shipped out 50-60,000 chairs each year, to markets across the country. DeFrehn also produced items such as park benches and porch swings. The company continued to operate in its Hornerstown location until the early 1970s. The Century Stove & Manufacturing Company was founded shortly after 1900. It produced a large variety of stoves, space heaters, and parts and accessories for heating equipment. It grew large enough to open a branch office in Kansas City, Missouri. During the Depression, however, the plant was bought out by National Radiator Co. and was used only for sheet metal production. 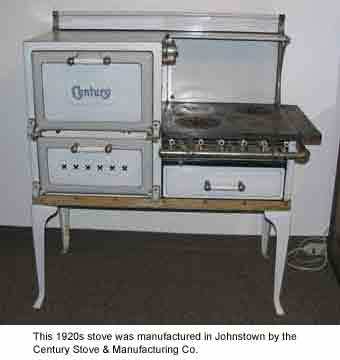 “Made in Johnstown” includes examples of stoves and heaters, including the one shown here. During the 1800s, pottery was used for a range of household and farming purposes. 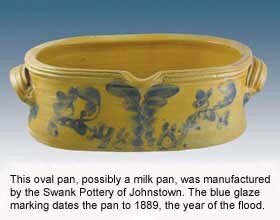 Johnstown was home to several pottery manufacturers, most notably the Swank pottery. The Swank Pottery was in operation for about 120 years. When demand for household pottery declined at the beginning of the 20th century, the firm’s focus shifted to refractory materials used in steel manufacturing. Examples of pottery and refractory materials from several area potteries are included in the exhibit. In the early 1900s, there more than a dozen small dairies in Johnstown. 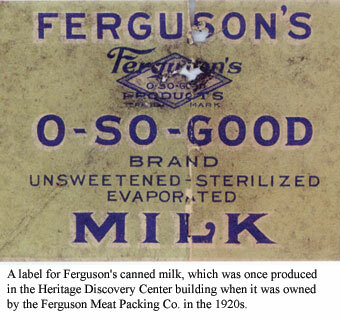 The three dairies that survived the longest were Sanitary Dairy, founded in 1902; Galliker’s Dairy, founded in 1914; and Alwine’s, founded in 1915. Alwine’s was bought by Sanitary Dairy in 1964. That company, which was later re-named Sani-Dairy, was bought by Penn Traffic Co. and then Dean Foods, and finally closed in 1999. Galliker’s survived all its competitors, has remained locally owned and operated, and is now estimated to be the third largest dairy in Pennsylvania. The National Radiator Company produced a large variety of radiators, as well as residential and commercial boilers and fittings for the plumbing and heating trade. In 1926, a company office building was erected at 221 Central Avenue; that building is now Cambria Rowe Business College. By 1938, the company had 461 employees. In the 1940s, however, radiant heat was becoming less popular and by the 1950s National Radiator merged with several other companies to survive. By 1961, the company was sold to SCM Metals Corp. 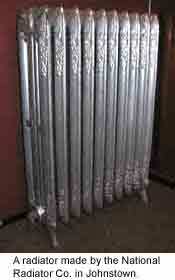 But radiators manufactured by the National Radiator Company are still in use in houses all over Johnstown. 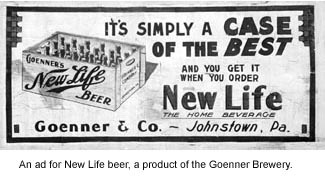 Johnstown had three breweries by 1866 — and by 1910, there were six, three of which were located in Cambria City. 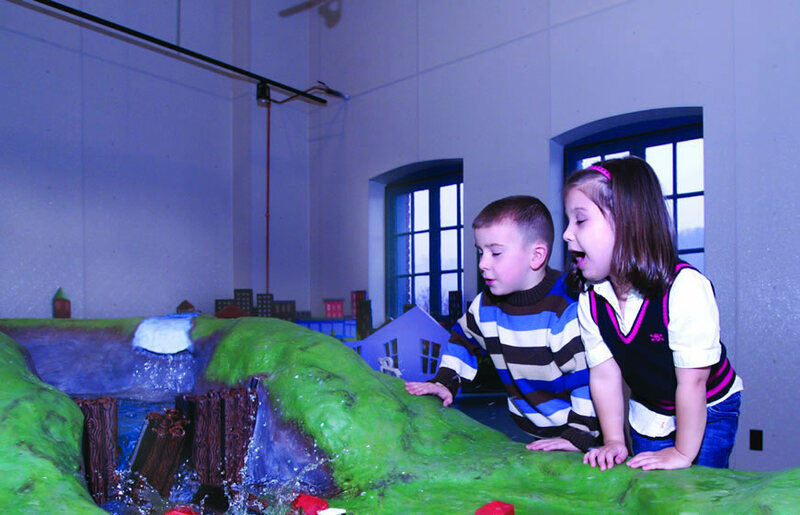 In fact, the Heritage Discovery Center is located in what was once the Germania Brewery, which was constructed in 1907. Prohibition put an end to the brewery business in 1919. A few of the larger breweries did reopen after Prohibition was repealed – the most successful of these, Goenner Brewery, stayed open until 1954. One of the most unusual manufacturing firms in greater Johnstown was the Modernola Talking Machine Company, which produced phonographs or “talking machines,” as they were once known. One of its unique products was a floor model phonograph with a lamp; and example is featured in the exhibit. By 1922, the company had a small factory on Station Street in Ferndale. 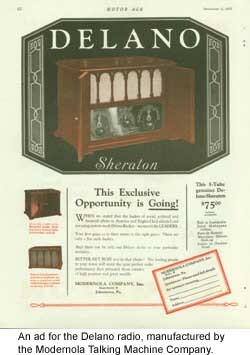 In addition to console and portable record players, the company also made several models of radios, such as the “Delano Sheraton.” The company closed in 1929, probably because few people could afford luxury items at the onset of the Depression. The exhibit includes a portable phonograph and a Modernola record player with console and lamp.